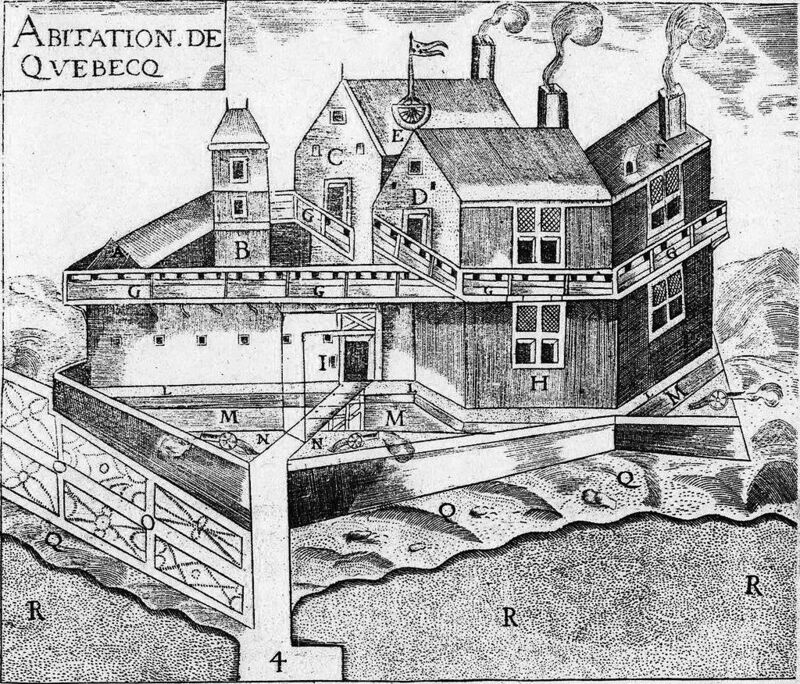 Figure 4.6 The Quebec habitation established by Champlain, ca. 1608. Tadoussac stands as the oldest continuously occupied European settlement in Canada. Located where the fresh water of the Saguenay River meets the salt water of the Gulf of St. Lawrence, Tadoussac was an outstanding site for hunting seals and whales. The Innu (Montagnais) were doing this when Cartier visited in 1535, and the Basques did it in the same century. The French settlement was established there in 1600 under the leadership of François Gravé du Pont and Pierre de Chauvin de Tonnetuit. Between them they had merchant and naval credentials that made them good candidates for the first fur-trade monopoly granted by a European monarch. This was a promising start but, like Cartier, they barely lasted their first winter. In 1603, Samuel de Champlain visited the site to assess its prospects. It was there that he met the Innu leader Begourat who was preparing an assault on the Mohawk, some 500 kilometres away. (Begourat’s mission foreshadowed another attack on the Iroquois in which Champlain would become involved, six summers later.) Tadoussac wasn’t an ice-free port but it stayed ice-free longer than Quebec so it would have a role to play for many years to come in the development of the Canadien project. Anyone familiar with hockey will recognize instantly the iconic crest of the Montreal Canadiens but, outside of Quebec, not everyone understands the meaning of the “H” contained within the “C.” Les habitants du Canada is the full and official team name, a fact that deserves mention here because of another nomenclature issue. People in the colony of Canada referred to themselves (and were referred to as) habitants or as Canadiens. Until the Conquest there are, technically speaking, no Canadians (with an “a” instead of an “e”). Thereafter there are both kinds. For the purposes of consistency and respect for historical distinctions, “Canadiens” is used in this text to describe the people of the St. Lawrence Valley whose ancestry is French; “Canadians” will be used later in the text to identify people living in Upper Canada (a.k.a Canada West, Ontario) and those anglophones in Montreal after the Conquest. After spending some time in Acadia, Champlain began the process of establishing a forward post at Quebec in 1609. With a complement of barely 50 men, Champlain was able to achieve much to sustain the French presence. A fortified settlement — a habitation — was constructed and an alliance established among the Algonquin, the Wendat (Huron), and the French. Iroquet and Outchetaguin, respectively leaders of the Algonquin and the Wendat, initiated talks with Champlain and drew the French into a long-running conflict with the Haudenosaunee to the south. The French had signed an alliance with the Innu (Montagnais) and the Algonquin against the Haudenosaunee five years earlier, so Champlain was following through with an earlier commitment to his allies. 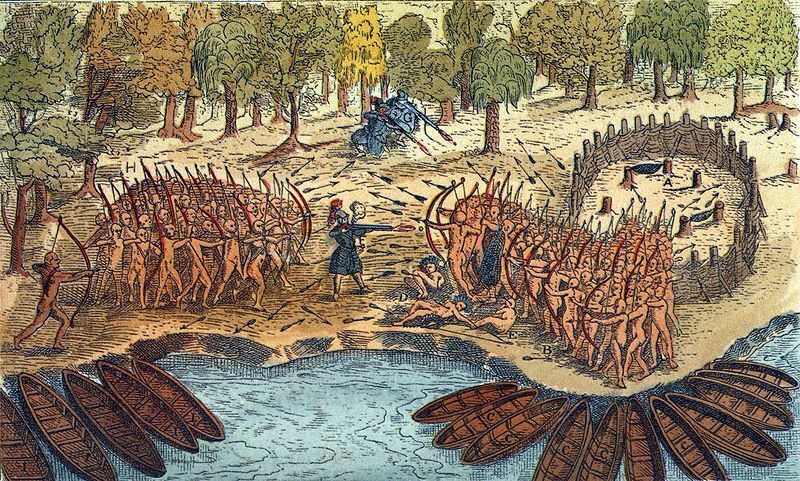 The battle at Ticonderoga — in which Champlain’s first shot from his arquebus allegedly killed two Onondaga chiefs — was to initiate a long cycle of conflict with the Five Nations. This alliance shaped local patterns over the long term; when Champlain allied himself with the Wendat, their long-standing enemies, the Iroquois, allied themselves with the Dutch and then the British. Was Champlain duped into these “Mourning Wars” by manipulative Aboriginal allies who could see that his main reason for being in the St. Lawrence was furs and that he’d do whatever was necessary to secure a steady supply? Possibly. Champlain’s vision for the colony in 1609 did not extend very much beyond exploring opportunities for wealth from trade. He had neither the mandate nor the resources to establish a colony of permanent settlers (as opposed to temporary sojourners who would return to France to enjoy their profits). The choices he made in these years have to be understood, therefore, in the context of a man who had no reason to feel confident in the future of the colony he created. 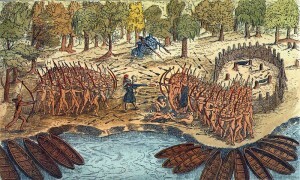 Figure 4.7 The Wendat and Algonquin armies take the battle to the Onondaga villages in 1609, accompanied by their new French ally, Champlain. For the first few decades of the colony’s existence, the French population numbered only a few hundred, while the English colonies to the south were much more populous and wealthy. In 1627, France invested in New France, promising land parcels to hundreds of new settlers with the hope of turning what they were now calling “Canada” into an important mercantile and farming colony. Champlain, now in his late 50s, was named governor of New France. Almost immediately the cultural outlines of Canada were being managed: the colony forbade non-Roman Catholics from living there. Cardinal Richelieu’s star was on the ascendant in the French court — he was by 1626 a leading figure in the Catholic Church and was Louis XIII’s chief minister — and he was among the first to see the possibility of a longer-term commitment to the colony, providing it was a sanctuary for Catholics. Protestants were required to renounce their faith if they wished to establish themselves or stay in New France. Many chose instead to move to the English colonies, a trend that did nothing to increase the size of the French colonies. The economic development of New France was based on two staple commodities of the time: during the 16th and early 17th centuries, it was dominated by the Atlantic fisheries, and during the latter half of the 17th and 18th centuries, as French settlement penetrated farther into the continental interior, it was dominated by the fur trade. Officially, the French Crown articulated a desire for a thriving colony in New France. Practically, there was little interest in (and some fear of) depopulating the countryside of France to seed the St. Lawrence Valley and Acadia. And, of course, colonies are costly. Rather than directly sponsor a colonial enterprise, the Crown opted for what we would today call a “P3 model”: a public-private partnership. Monopolistic trading rights were granted to a company combined with an obligation to settle and manage its colonial claims in North America. In 1627 responsibility for the whole of New France was handed off to the Compagnie des Cent-Associés, a short-lived experiment with what was essentially a joint-stock operation. Shareholders in France were to be badly disappointed when the company’s fleet was captured the following year by the English and the base of operations in Quebec fell in 1629. The Compagnie struggled on after the restoration of New France in 1632 but the Wendat crisis and continuous raids by the Haudenosaunee took a heavy toll. At the mid-17th century the whole of New France was little more than a cluster of trading posts with a negligible population base, one that was heavily dependent on food shipped from France or purchased from Aboriginal farmers and hunters. In 1645 the Compagnie turned to local merchants in the colony and allowed the Communauté des habitants to pay them for the privilege of managing the unwieldy colony. The monopoly in trade collapsed around 1652, opening a decade of fur trading free-for-all in Canada. Why was this first half-century of colonial activity in New France so unimpressive in its accomplishments? First, there was the Aboriginal context: conflict between the Haudenosaunee Five Nations League and the Wendat-Algonquin-Innu alliance was something that no colonial minister could control or do much to alter. As well, the colony was dependent on Aboriginal traders in the fur trade as it had neither the manpower nor the permission of the local First Nations to engage directly in trapping. Second, Protestant hostility in the form of fur trade competition and armed raids by Dutch and English enemies was more than the French Crown was prepared to counter. Overall, the Crown saw little to be gained in investing heavily in the colony. But substantial investment was necessary. The short growing season of the northern colonies demanded support in the early years as farmers adjusted to new and alien conditions; subsidies would be needed to encourage emigration and cover the costs of clearing new land until crops started to come in. So long as the purpose of the colony was to harvest furs and minimize loss of life, under-investment in a long-term colonial vision was virtually inevitable. The French colony of Canada was established in the St. Lawrence Valley to tap fur resources farther inland. Doing so gave shape to the colony’s settlement patterns and was the foundation of all relations with Aboriginal peoples in the region and beyond. France experimented with commercial monopolies in this period. 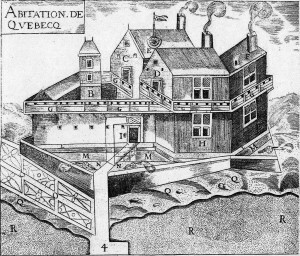 Champlain Habitation de Quebec by Jeangagnon is in the public domain. Iroq2 by Sakateka is in the public domain. 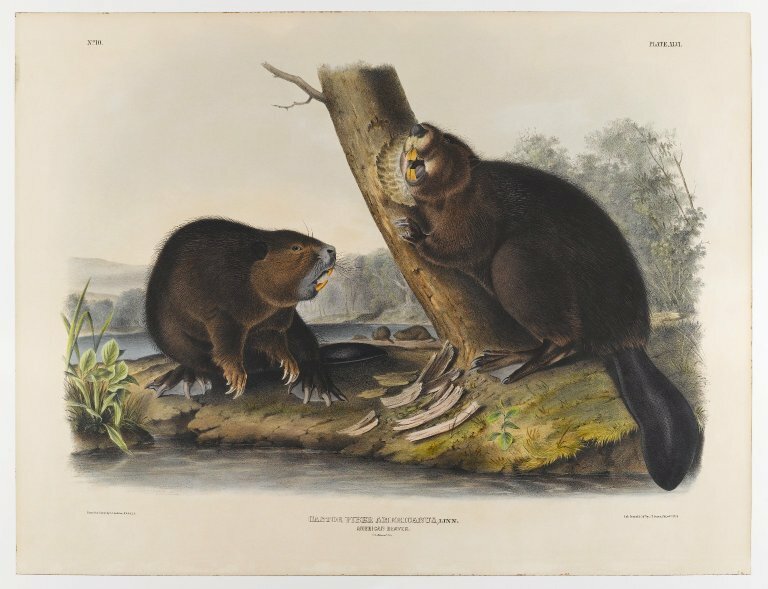 American Beaver by BrooklynMuseumBot is in the public domain. 4.3 Canada, 1608-1663 by John Douglas Belshaw is licensed under a Creative Commons Attribution 4.0 International License, except where otherwise noted.